August 4, 2012 - U.S. Transportation Secretary Ray LaHood and Acting Federal Aviation Administrator Michael Huerta addressed the July 31, 2012 incident at Reagan National Airport with a press conference at the U.S. Department of Transportation headquarters. 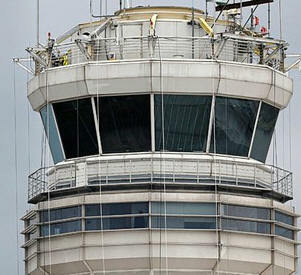 Summary of the July 31, 2012 incident: Safety is the FAA’s top priority. The agency is investigating an incident that took place just after 2 p.m. on Tuesday, July 31, 2012, when the Potomac TRACON initiated a change in the traffic flow at Reagan National Airport (DCA) due to bad weather developing south of the airport. DCA had been landing and departing aircraft on Runway 1, from the south to the north. Due to the bad weather developing, the TRACON was reversing operations at the airport to land and depart aircraft from the north to the south on Runway 19. During the switchover of operations, there was a miscommunication between a manager at the TRACON and two traffic management coordinators at the DCA tower. The miscommunication should not have happened. FAA safety officials are investigating why the miscommunication occurred and will take action as appropriate. The miscommunication led to a loss of the required separation between two regional jets (Chautauqua Airlines 3071 and Republic Airlines 3467) departing from Runway 1 and a regional jet (Republic Airlines 3329) inbound for Runway 19. An air traffic controller at DCA tower immediately realized that a loss of separation was occurring and acted quickly to correct the situation. The loss of separation should not have occurred. However, at no point were the three aircraft on a head to head course. Both departing aircraft were cleared for takeoff while Republic Airlines 3329 was inbound. At the closest proximity, Chautauqua Airlines 3071 and Republic Airlines 3329 were separated by .82 nautical miles (lateral) and 800 feet (vertical) as Chautauqua Airlines 3071 continued its climb. The closest proximity of the two Republic Airlines aircraft was 2.07 nautical miles (lateral) and 800 feet (vertical) – both aircraft were moving away from each other. Update - August 07, 2012 – From Michael P. Huerta, Acting FAA Administrator. As the FAA's Air Traffic Organization continues its investigation of the July 31st incident at Reagan National Airport, I'd like to provide an interim update. The preliminary findings confirm what we initially reported, that miscommunication between the Potomac 1'RACON and DCA Tower resulted in losses of separation. Safety is our top priority - this incident should not have happened. We have reconfirmed that at no point were the aircraft on a head-to-head course and the aircraft remained at different altitudes. Initial information indicated that the miscommunication occurred when the TRACON and Tower were turning the flow of traffic at the airport due to bad weather developing south of the airport. As our investigation has continued, we have concluded that management's intention at the TRACON was initially only to turn the direction of a series of arrivals. Only after the loss of separation events, was the flow of traffic at the airport turned completely. The procedure used for this series of arrivals involved opposite direction operations. These operations occur when an arrival or a departure is cleared to use a runway end that is opposite from the established flow of the airport. These procedures are used at DCA and at airports around the country in a variety of situations including noise mitigation and cargo operations. While this procedure encompasses many of the same elements as turning the flow of an airport, there is no standard protocol in place, and we believe this contributed to the miscommunication. In light of these preliminary findings, out of an abundance of caution, there are some immediate steps we are taking. We have initiated a temporary suspension on opposite direction operations at commercial airports until detailed procedures can be developed, trained and implemented. Although most air traffic facilities have detailed procedures for runway change operations, procedures for opposite direction arrivals and departures are not standard. We expect to have these detailed procedures in place across the system within a month, and sooner than that at locations that have frequent demand for opposite direction operations. In the interim, we will only use this type of operation in an emergency situation. While we are training on these new procedures, we will also reinforce the necessity for diligently following existing protocols when we turn the direction of an airport. In the course of our investigation, we have also identified other opportunities for improvement in the training we provide to certain tower controllers and in managerial oversight of air traffic operations. The actions taken by the local controller at DCA Tower on July 31 were absolutely appropriate to resolve the immediate conflict. The controller worked quickly to identify the issues and take action. This incident did reveal a need for continued vigilance regarding radar requirements, procedures, communications and phraseology. The FAA is working with the National Air Traffic Controller Association (NATCA) to determine what additional training is necessary for tower controllers and what resources are needed to provide additional radar training to tower controllers responsible for separation of aircraft in Class B airspace. This incident also raised the issue that front line managers (FLM) are not only overseeing operations in the tower, but also managing administrative tasks. During times of moderate to heavy and/or complex traffic, we need to be sure that they are solely focused on the operations in the facility, and not handling administrative duties at that time. We will be working over the coming weeks to make sure our resources are properly deployed so tower management has the appropriate support. Separately, the FAA interviewed the pilot of inbound Republic 3329 who had reported low fuel to the tower and found that the aircraft did have adequate fuel, and, in fact, upon landing had more fuel than the FAA regulations require as a reserve. As we continue to evaluate detailed findings of the incident, we will work with NATCA to develop "lessons learned" briefings for all operational personnel. Longer term, the agency will continue its collaboration with NATCA to ensure that air traffic controllers have adequate protocols, procedures and training in place to continue to maintain the high level of safety for the national airspace. We also look forward to coordinating and cooperating with the NTSB in their investigation. GAO Reports Weaknesses In Determining Foreign Flight Students Status In The U.S.